Hand-carved Chinese limestone oval mortar or trough. Fashioned out of a single block of limestone. Great inside or in the garden as a decorative vessel or a sculptural birdbath. 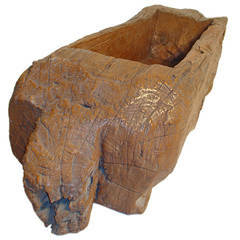 Large sculptural carved wooden trough from Indonesia. Great indoors or outdoors. Would make for a fantastic planter. Multi-functional stone trough, could be used as anything from a planter to an outdoor cooler. Origin France circa 1680 Measurements: 36" D x 106" W x 19" H.
French carved stone mortar shaped jardinière from Provence in the south of France. This authentic piece has a beautiful, original patina, and brings life to any space.